WHEREAS , QUAPE PTE LTD (“QUAPE PTE LTD”) of 8 Burn Road #15-11 Singapore 369977 is a Internet Content service provider connected to the Internet. 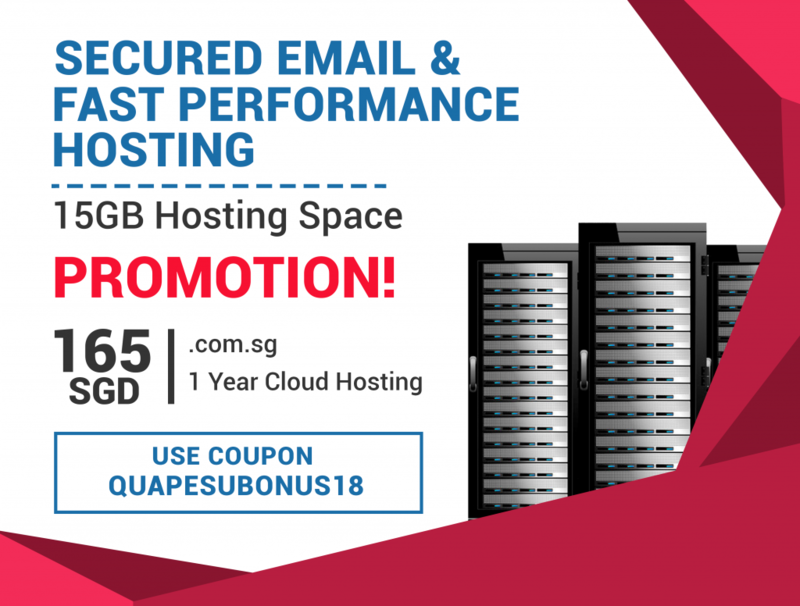 QUAPE PTE LTD provides at the following website: www.quape.net , (“QUAPE PTE LTD Website”) QUAPE PTE LTD Singapore Broadband Web Hosting Services over the Internet through access to its Web Server, FTP Server and SMTP & POP Mail Server services. “QUAPE PTE LTD Website” means either www.quape.net offering hosting and transfer services over the Internet through access to its Web Server, FTP Server and SMTP and POP Mail Server services. 2.2 This Agreement comes into effect on commencement and shall continue in force until terminated by either party. The Agreement upon expiry of the Original Term shall be automatically renewed for a further period of 1, 3, 6, 12 or 24 months (vary from hosting services), as the case may be on the same terms and conditions herein ( save for any revisions or changes made by QUAPE PTE LTD and published on-site ), unless or until terminated by either party earlier in accordance with clause 10. A renewal invoice will be sent to the Client one month prior to expiry of the Original Term. 3.2 If any registration data that the Client provides is untrue, inaccurate, not current or incomplete, QUAPE PTE LTD reserves the right to terminate the Client’s account and the Client’s rights to use the Services. If QUAPE PTE LTD shall acquire an Internet Domain Name on behalf of the Client, Internic (or a local NIC) will invoice the Client separately for the name. In this respect , please refer to current prevailing charges as set out in the respective Internic or local NIC websites ( as at March 2006, global domains .com .net .org charges are S$15 per year, local domains .com.sg .org.sg charges are S$48 per year as at Feb 2009). The Client hereby waives any and all claims which it may have against QUAPE PTE LTD, for any loss, damage, claim or expense arising out of or in relation to the registration of such Domain Name in any on-line or off-line network directories, membership lists or registration lists, or the release of the Domain Name from such directories or lists following the termination of the providing of this service by QUAPE PTE LTD for any reason. For Domain name order online is not reserved until full payment is received and depending on availability at the point of processing. 4.1 DNS hosting is provided free to customer at ns01, ns02, ns03, ns04 ns05, ns06, ns07, ns08, ns09 and ns10.quape.net. Free DNS hosting and service are recognized as the authoritative source for DNS entries in your domain or domains, QUAPE PTE LTD is not obligated to ensure that (a) your DNS records are correctly configured, (b) your DNS entries will be properly resolved, or (c) QUAPE PTE LTD’s DNS will be continuously available on an uninterrupted basis. You acknowledge that it is your responsibility to test QUAPE PTE LTD’s implementation and administrate your DNS entries or your DNS hosting at your own via QUAPE PTE LTD control panel and notify QUAPE PTE LTD of any misconfiguration or error in that implementation. In the event that your DNS hosting arrangement with QUAPE PTE LTDis terminated, you agree that QUAPE PTE LTD has no obligation to provide DNS files, settings, or any other material related to your DNS entries in QUAPE PTE LTD DNS system to you or any third party, and you agree that QUAPE PTE LTD has no obligation to forward DNS requests to or from your new DNS host. 5.1 Subject to terms provided in the QUAPE PTE LTD Billing Policy, QUAPE PTE LTD shall charge and the Client shall make payment for the provision of the Services in the manner and at the rates prescribed by QUAPE PTE LTD in the QUAPE PTE LTD Website. 5.3 The set-up fee and payment are due at the time the application and Agreement are filled out, and returned to QUAPE PTE LTD. Subsequent payments are due according to the selected fee schedule following the establishment of the web space or service on the Internet. Web space and services will be billed a minimum of 1 month or the minimum subscription period of a service in advance depending on the selected fee scheduled . Subsequent notice of pre-payments is provided two month before the expiry of the prescribed Service or the paid balance available, whichever is sooner, as per the selected fee schedule. In the event that the Client fails to pay for such services in advance, QUAPE PTE LTD shall be entitled to unilaterally terminate this Agreement and discontinue the service until payment is made. A reactivation fee (currently S$50) shall be charged. 5.5 All payments due to QUAPE PTE LTD shall be made in the manner prescribed at the QUAPE PTE LTD Website under the Payment Selection web page. In the event that any of the sums due under this Agreement or any part thereof is unpaid for a period of 14 days after it is due, the Client shall pay interest at the rate of 2% per month from the date such sum was due until payment is received in full without prejudice to any other rights of QUAPE PTE LTD here under. QUAPE PTE LTD reserves the right to terminate or delete immediately any of the Virtual Environment(s) created beforehand should payment not be received by due date. 5.6 The Client shall pay any applicable Tax, imposition, duty, levy whatsoever (“the taxes”) which may be from time to time imposed or levied by any governmental, statutory or tax authority in Singapore on or calculated by reference to the amount of any sums receivable by QUAPE PTE LTD in relation to this Agreement. The account will be setup within the next two (2) business days for Credit Card payment upon approval, and five (5) business days for Cheque payment, upon QUAPE PTE LTD receiving the set-up fee and payment of the Services except dedicated hosting & servers. 7.1 Client will provide QUAPE PTE LTD with material and data in a condition that is “server-ready”, which is in a form requiring no additional manipulation on the part of QUAPE PTE LTD. QUAPE PTE LTD shall make no effort to validate this information for content, correctness or usability. 7.2 Use of QUAPE PTE LTD’s service requires a certain level of knowledge by Client in the use of Internet languages, protocols, and software. This level of knowledge varies depending on the anticipated use and desired content of Client’s web space by the Client. The following examples are offered. 7.3 The Client agrees that he or she has the necessary knowledge to create and maintain their web site. If the Client changes the configuration on the server in such a way that it no longer works, QUAPE PTE LTD will fix it for the Client at the prevailing rates (currently $70/ hour) charged on the basis of the minimum of 1 hour. 8.1 QUAPE PTE LTD will exercise no control whatsoever over the content or format of the information passing through its network or residing on its or its Clients’ servers. QUAPE PTE LTD will not be responsible for any damages that may be suffered by the Client, including loss of data resulting from delays, non-deliveries or service interruptions by any cause or errors or omissions of the Client. In the event that material provided by the Client is not “server-ready”, QUAPE PTE LTD may, at its option and at any time, reject and delete this material, including but not limited to after it has been put on QUAPE PTE LTD’s server(s). 8.2 QUAPE PTE LTD agrees to notify the Client of its refusal of the material and afford Client the opportunity to amend or modify the material to satisfy the needs and/or requirements of QUAPE PTE LTD. If the Client fails to modify the material, as directed by QUAPE PTE LTD, within a reasonable period of time, which shall be solely determined by QUAPE PTE LTD, the Agreement shall be deemed to be terminated. 8.3 Use of any information obtained by way of QUAPE PTE LTD is at the Client’s own risk, and QUAPE PTE LTD specifically denies any responsibility for the accuracy or quality of information obtained through its services or its representatives. 8.5 The Client agrees that QUAPE PTE LTD shall be entitled (but shall not be obliged) at any time, at QUAPE PTE LTD’s discretion and without prior notice, to temporarily suspend the operations of the Client’s Virtual Environment or part thereof for updating, maintenance and upgrading purposes, or any other purpose whatsoever that QUAPE PTE LTD deems fit. QUAPE PTE LTD specifically denies any responsibilities for any loss, liability or damages arising as a consequence of such unavailability. 8.6 QUAPE PTE LTD maintains control and any ownership of any and all I.P. numbers and addresses that may be assigned to Client and reserves in its sole discretion the right to change or remove any and all IP numbers and addresses. 8.7 QUAPE PTE LTD shall not be liable for non-performance or late performance of any obligation hereunder, to the extent and for such a period of time as such non-performance or late performance is due to reasons beyond its reasonable control, including but not limited to, act of God, civil or ethnic unrest, shortage or unavailability of labour, revolution or insurrection, war (whether declared or not), terrorist activity, religious events, bombings, blockages, embargoes, general labour strikes, power failures, acts, restrictions, regulations, bye-laws, prohibitions or measures of any kind on the part of any governmental parliamentary or local authority or any governmental regulations imposed after the fact, import or export regulations or embargoes, acts or defaults of any telecommunications network operator, circumstances where communications lines (whether in Singapore or elsewhere) cannot be used for reasons attributable to third party telecommunications carriers, fire, explosions, floods, earthquakes or any other natural disaster, chemical contamination, unavailability of equipment or components not caused by QUAPE PTE LTD’s act or default. 9.1 Electronic forums such as mail distribution lists and Use Net news groups all have expectations regarding subject area and appropriate etiquette for posting. Users of these forums should be considerate of the expectations and sensitivities of others on the network when posting material for electronic distribution. The network resources of QUAPE PTE LTD may not be used to impersonate another person or misrepresent authorization to act on behalf of others or QUAPE PTE LTD. All messages transmitted via QUAPE PTE LTD should correctly identify the sender; users may not alter the attribution of origin in electronic mail messages or posting. Users must not attempt to undermine the security or integrity of computing systems or networks and must not attempt to gain unauthorized access. 9.2 Use of distribution lists via unsolicited electronic mail or other mass electronic mailings is strictly prohibited. QUAPE PTE LTD reserves the right to deactivate the Client’s Virtual Server account(s) upon an indication of such activity. 10.2 Notwithstanding the above, QUAPE PTE LTD may terminate service under this Agreement at any time, without penalty, if the Client fails to comply with the terms of this Agreement or upon an indication of credit problems including delinquent payments. 10.3 Termination shall be accompanied by a written or electronic notice to the other party. QUAPE PTE LTD shall not be liable to Client or any third party for termination of access to the QUAPE PTE LTD Website/ Services. 10.4 Upon termination of this Agreement, the Client’s use of the Services immediately ceases and the Client acknowledges and agrees that QUAPE PTE LTD may immediately delete files in the Client’s [account], bar further access to such files / Services. 10.5 The Client agrees that upon termination of this Agreement, the Client will pay any and all outstanding fees, charges and payments due to QUAPE PTE LTD in full within 30 days after termination. 10.6 Free services – QUAPE PTE LTD may terminate or suspend your access to the Service and any related service(s) at any time, with or without cause, with or without notice, effective immediately, for any reason whatsoever. QUAPE PTE LTD has no obligation to store or forward the contents of your account. If there is any indication that you are using your account for illegal activity, your account will be terminated immediately and without further notice. 10.7 Free Email account hits the quota will be suspended automatically by our system, email users are responsible to maintain and keep their mailboxes within the limit, QUAPE PTE LTD will not hold any responsibility for any email not receive or undeliver for the email accounts had suspended. (a) The Client expressly agrees that use of QUAPE PTE LTD’s Equipment is at the Client’s sole risk. The Client acknowledges and agrees that any material or data downloaded or otherwise obtained through the use of the Services and/or Equipment is done at the Client’s own discretion and risk and that the Client will be solely responsible for any damage to the Client’s own computer system or loss of data that results from the download or use of such material or data. (b) QUAPE PTE LTD disclaims, in respect of the Services and/ or Equipment and use thereof, all warranties of any kind, either express or implied, including but not limited to, warranties of title or implied warranties of merchantability or fitness for a particular purpose and non-infringement as well as all warranties arising by usage of trade, course of dealing or course of performance. (c) QUAPE PTE LTD, makes no warranty that the Services and /or Equipment will not be interrupted or error free; nor does QUAPE PTE LTD make any warranty as to the results that may be obtained from the use of the Services and/or Equipment or as to the accuracy, reliability or content of any information service or merchandise contained in or provided through the Services and/or Equipment. (d) Under no circumstances whatsoever, (including negligence), shall QUAPE PTE LTD, its offices, agents or any one else involved in creating, producing or distributing QUAPE PTE LTD ‘s Server service be liable for any loss or direct, indirect, incidental, special or consequential damages that result from the use of or inability to use the QUAPE PTE LTD Services and /or Equipment; or that results from mistakes, omissions, interruptions, deletion or loss of files, errors, defects, delays in operation, or transmission or any failure of performance, including without limitation, acts of God, communication failure, theft, destruction or unauthorized access to QUAPE PTE LTD ‘s records, programs or services. (e) QUAPE PTE LTD shall not be liable for any obligation, liability, right, claim or remedy in tort, whether or not arising from the negligence of QUAPE PTE LTD.
(f) Notwithstanding any other provision of this Agreement, the Client’s exclusive remedies for all damages, losses and causes of actions whether in contract, tort including negligence or otherwise, shall not exceed the aggregate dollar amount which Client paid during the term of this Agreement. . In the event of system unavailability due to default of QUAPE PTE LTD, QUAPE PTE LTD expressly limits its damages to the Client for any such non-accessibility time or other down time to the prorated monthly charge during the said system unavailability provided always that QUAPE PTE LTD, is notified and given details within 48 hours of such incidence. 12.3 Internet Relay Chat: QUAPE PTE LTD Broadband Hosting Services currently prohibits its customers from operating IRC or IRC Bots on any of our web site hosting servers. On-line Conference Centers can be installed and used only as part of a dedicated servers available for purchase. 12.4 Spamming Not Permitted: You must not use any QUAPE PTE LTD Services and equipment or any email address hosted by QUAPE PTE LTD servers in connection with the transmission of spam, flames, mail bombs, or substantially similar, unsolicited email messages. Your domain may not be referenced as originator, intermediary, or reply-to address in any of the above. This shall include the sending of unsolicited mass mailings from any other service that in any way implicates the use of the QUAPE PTE LTD Services and equipment or any email address hosted by QUAPE PTE LTD. A message is considered to be unsolicited if it is posted in violation of a newsgroup charter or if it is sent to a recipient who has not requested or invited the message. Simply making one’s email address accessible to the public will not constitute a request or invitation to receive messages, for purposes of enforcing this provision. When any customer is found to have been engaged in spamming in violation of this agreement, QUAPE PTE LTD reserves the right to disable that customer’s web site without warning. In addition, QUAPE PTE LTD may impose a S$200 penalty for each spam policy violation. QUAPE PTE LTD solely reserves the right to refuse or cancel service to spammers. QUAPE PTE LTD reserves the right to determine what violates this policy. As such, any violation may result in cancellation of services without refund. For additional information for Singapore control resoure centre please visit http://www.spamcontrol.org.sg. 12.5 Game Servers: QUAPE PTE LTD Broadband Hosting Services currently prohibits its customers from operating Game Servers on any of our web site hosting servers. Game Servers can be installed and used only as part of a dedicated servers available for purchase. 12.7 Warez Sites: Warez Sites are sites that are typically used by “hackers” to trade (upload/download) illegally pirated copies of software programs with one another. QUAPE PTE LTD has a zero-tolerance policy on all Warez Sites. Sites that become a trading post for “warez” programs will be reported to any and all regulatory, administrative, and/or governmental authorities for prosecution. In addition to your account being deleted from our servers, you may face legal action that can be taken against you by the programmers/software companies of the copyrighted software. 12.8 Other Unacceptable Content: Illegal Material or material that is against public policy, material that may be detrimental to the public health, safety, or welfare. (Such as, but not limited to: Anarchists Cookbook, bomb making, weapon information, etc., or anything else that may be considered detrimental or illegal.) QUAPE PTE LTD will be the sole arbiter as to what constitutes a violation of this provision, and reserves the right to terminate an account at any time for any reason without refund. 12.9 Network Abuse: Shared and VPS hosting accounts, operate on shared network resources. This means that there are several hosting accounts per server. Excessive use or “abuse” of these network resources by one customer have a negative impact on all other customers. In all fairness, you are not allowed to deliberately consume network resources in an excessive manner, this includes but is not limited to: CPU time, memory, disk space and each mailbox is limited to 200Mb maximum and recipients of 50 for shared hosting.. You are also not allowed to use resource-intensive programs that can negatively impact other customers or the performance of our systems including sending large volume of mails (example 200 mails or more at one time within 1 hour) which has congested the entire shared mail server and affecting the rest of the subscribers sharing the service or server, thus mass mailing activites are strictly prohibited on all Shared hosting plans. High network traffic and throughput is not a problem for QUAPE PTE LTD, but extreme network traffic or uploading and downloading can sometimes create problems. QUAPE PTE LTD’s servers are configured to shut off any account when its bandwidth allowance is exceeded. You are allowed to exceed your maximum bandwidth allowance without being shut off as long as you purchase additional traffic in advance at S$5.00 for each additional GB of throughput. QUAPE PTE LTD always recommends purchasing backup storage/service with any and all systems/services. Clients may purchase backup drives and/or backup storage and perform their own backups–with or without QUAPE PTE LTD or control panel supplied backup software enabled, or may purchase a managed backup solution from QUAPE PTE LTD like the R1soft CDP backup service at the frequency of ONE backup daily. As per our TOS, BACKUP and SERVER RELIABILITY section, your use of this service is at your sole risk. QUAPE PTE LTD is not responsible for files and/or data residing on your account. You agree to take full responsibility for files and data transferred and to maintain all appropriate backup of files and data stored on QUAPE PTE LTD nodes and servers. No QUAPE PTE LTD resources and servers may be used to perform any form of DoS attacks. If a server is being attacked by any form of DoS, the said account will be terminated with immediate effect. Customers may subscribe to our anti DDoS protected network to have the account re-activated and protected from further attacks. If the attack continues and goes beyond the limit where our DoS protected network could mitigate, QUAPE PTE LTD will null-route, ACL or otherwise suspend the services in its entirety to maintain quality of service for other Customers on our network. 15.1 Client agrees that it shall defend, indemnify, save and hold QUAPE PTE LTD, its subsidiaries, affiliates, directors, officers, managers, agents, employees harmless from and against any and all demands, liabilities, losses, costs and claims, including reasonable attorneys’ fees on an indemnity basis, (“Liabilities”) asserted or made by any third party, due to or arising or resulting from the Client’s use of the Services and/or Equipment or breach of any of the terms herein or any service provided or performed or agreed to be performed or any product sold by Client, its agents, employees or assigns using the Services. Client agrees to defend, indemnify and hold harmless QUAPE PTE LTD against Liabilities arising out of (i) any injury to person or property caused by any products sold or otherwise distributed in connection with the Services and/or Equipment ; (ii) any material supplied by Client infringing or allegedly infringing on the proprietary rights of a third party; (iii) copyright infringement and (iv) any defective product which Client sold on the Services. 15.2 Due to the public nature of the Internet, all information should be considered publicly accessible, and important or private information should be treated carefully. QUAPE PTE LTD is not liable for protection or privacy of electronic mail or other information transferred through the Internet or any other network provider or its customers may utilize. 16.1 Subject to terms provided in the QUAPE PTE LTD Reseller Agreement, the Client is allowed to resell the storage and transfer services provided by QUAPE PTE LTD. The Client agrees to handle and is responsible for all third-party customer’s content, support, set-up and maintenance. 16.3 The Client acknowledges and agrees that QUAPE PTE LTD Pte Ltd and its stuff shall not be responsible or liable, directly or indirectly, in respect of the Client’s use of QUAPE PTE LTD’s Reselling service. The Client further acknowledges and agrees that it is solely responsible or liable for any damage, loss caused or alleged to be caused by or in connection with use or reliance on the aforesaid services offered by the Client pursuant to the Reselling service. The Client shall be responsible to the third party in respect of all queries relating to the services offered. Thus, if the Reseller anticipates offering a particular feature, the Reseller must have a thorough knowledge of the feature. 16.4 The Reseller agrees and warrants that he or she has the necessary knowledge to create and maintain the third party’s anticipated Webspace. Reseller agrees that it is not the responsibility of QUAPE PTE LTD to provide this knowledge or client Support outside of the defined service of QUAPE PTE LTD.
17.1 All hosting fees (prices) are subjected to change and will be updated on QUAPE PTE LTD web pages. 17.2 All hosting fees paid to QUAPE PTE LTD generally are not refundable, however in certain circumstances will be considered at the discretion of the Company Management. 18.1 QUAPE PTE LTD reserves the right to change the terms, conditions, and notices under which the Services are offered, including but not limited to the charges associated with the use of the Services. Changes in the service fees will take effect at the end of the Clients’ prepaid term; the continuation use of the Services beyond the date of such change shall constitute acceptance by the Client of the Agreement. 19.1 The Client acknowledges that the data, information and/or content, including but not limited to text, software (including any HTML, WML, java, java script, java or CGI script or any other computer code), music, sound, photographs, video, graphics, graphical user interface, forms, diagrams or other material, used in connection with, incorporated or contained in or presented to the Client through the QUAPE PTE LTD Website (all the aforementioned data, information, content and/or materials to be collectively referred to as “Content”) are the exclusive property of QUAPE PTE LTD and/or its third party licensors and are protected by intellectual property laws, including but not limited to, copyright and trademark laws. 19.2 The Client warrants that it has the right to use the materials (including any images and applicable trademarks) displayed in/ on the QUAPE PTE LTD Website and agrees to grant QUAPE PTE LTD a non-exclusive, world-wide royalty-free, irrevocable license and right to use (which will include the right to copy, reproduce and/or publish) the aforesaid materials (including any images and applicable trademarks) displayed in /on the QUAPE PTE LTD Website or any part thereof as well as to exercise all copyright and rights of publicity over such materials, including the use of such materials or part thereof in any advertising material. 19.3 No part of parts of the Content hereof may be reproduced, distributed, republished, commercially exploited, displayed, broadcast, hyperlinked or transmitted in any manner or by any means or stored in an information retrieval system without the prior written permission of QUAPE PTE LTD provided that permission is granted to download and/or print the materials from the QUAPE PTE LTD Website for personal, non-commercial use only and further provided the Client does not modify the materials and retains all copyright and other proprietary notices contained in the materials. The Client may not, without QUAPE PTE LTD’s permission, create derivative works from the Content or insert a hyperlink to the QUAPE PTE LTD Website or “mirror” any material contained on the QUAPE PTE LTD Website on any other server. Further, the name of QUAPE PTE LTD or any other trade mark, name of logo belonging to or used by QUAPE PTE LTD (collectively, “Trade Marks”) may not be used in any way, including in advertising or publicity pertaining to distribution of materials, without prior written permission. QUAPE PTE LTD prohibits use of any or all of the Trade Marks as a “hot” link to any other site unless establishment of such a link is approved in advance by QUAPE PTE LTD in writing. 20.1 All notices to a party shall be in writing and shall be made via e-mail to sales@QUAPE PTE LTD.net for notices to QUAPE PTE LTD or to the e-mail address that the Client provides to QUAPE PTE LTD as part of the registration data for notices to the Client, or such other address as either party may specify from time to time. 20.3 As an alternative, notices may be sent by registered mail to QUAPE PTE LTD at the address provided by the Client, if any or to the mailing address that the Client had provided during the registration stage. 20.4 QUAPE PTE LTD may also broadcast notices or messages on the QUAPE PTE LTD Website on other matters of importance and in such event, such broadcast shall constitute as valid notice to the Client. 21.2 QUAPE PTE LTD and the Client agree to allow a court or arbitrator to replace such invalid, unenforceable or void provision with a valid or enforceable provision which achieves to the greatest extent possible the economic, legal and commercial objectives of the invalid or unenforceable or void provision. 21.3 QUAPE PTE LTD ‘s failure to act with respect to a breach by the Client does not waive its right to act with respect to subsequent or similar breaches. Links to other Internet sites operated by third parties do not constitute sponsorship, endorsement, or approval by QUAPE PTE LTD of the content, policies, or practices of such linked sites. Linked sites are not operated, controlled, or maintained by QUAPE PTE LTD., and QUAPE PTE LTD. is not responsible for the availability, content, security, policies, or practices of linked sites, including without limitation privacy policies and practices. Links to other sites are provided for your convenience only, and you access them at your own risk.